Picture a sincere version of Flight of the Conchords that strangely share both the looks and mannerisms of Charlie Day and you’ve got the Brooklyn Brothers. 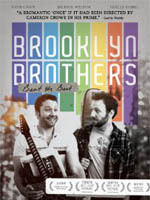 The creation of Brooklyn Brothers Beat the Best writer/director/star Ryan O’Nan, the duo (O’Nan and fellow actor Michael Weston) perform all of their own music in the film and are currently breaking cinematic walls on a real-life tour of the U.S. (their Philly date was at the type of place that none of us would frequent). If you’re into that kind of slick, high-end “indie” stuff (you know, music that’s by no means “indie”, but just about fits the bill as far as simplicity/sincerity go, “movie indie” we could call it [also see: the soundtrack for Hello I Must Be Going]…and yes, it’s obnoxious to define genres, but I think my point is made)…where was I…so maybe you’ll like the movie if you like this kind of music. It’s all subjective…I’m obviously stalling because I really didn’t care for this at all and had forgotten that I’d watched it before it was even over. Alex (O’Nan) is a struggling thirty-something musician who can’t seem to find his musical soulmate. He plays to empty houses with crazy, temporary bandmates, standard stuff. After losing his day job performing for mentally handicapped students (there’s a gag centered around this that, like many of the punchlines in this film, strangely takes place off-camera) and teams up with a seemingly unsettled stalker-type who already has a tour booked. They play a bunch of gigs for local yokels and quirky scenesters, meet a love interest in the form of a sarcastic-turned-friendly promoter, and, of course, become best friends in the process thanks to the power of music. At the core of the film though is this autumn’s most recurring (and annoying) theme: the inner frustrations of the non-suffering, thirty-something male. In this case, Alex is battling mediocrity, the expectations of his parents, and the success of his brother (Andrew McCarthy, always a pleasure). Just like recent releases Sleepwalk with Me and Liberal Arts, Brooklyn Brothers stars the film’s writer/director as a self-obsessed protagonist whose cliched and insignificant troubles are presumably meant to inspire those who identify (I’m 33 and I find all of these people to be whiny, immature brats). Seriously, this isn’t the stuff that films are made of…and there’s something larger happening here, a warning regarding the eventual decline of worthwhile low-budget filmmaking as well as the future of film distribution. Unfortunately, I can’t think about all of that right now, I have to move on to review yet another film about the troubles of a bland thirty-something avatar, this one is female and recently divorced…when will it end??? Oh, and the film ends in a musical montage recapping the duo’s road trip, I think that says a lot. To summarize: I didn’t care for it, you might, enjoy. Brooklyn Brothers Beat the Best opens tomorrow out at Cinema 16:9 who recently re-designed their website yet again…be sure to check out the smallest/coolest theater in Philadelphia while you’re there. It’s funny, they went from too little information to too much information, there’s so much to look at now!